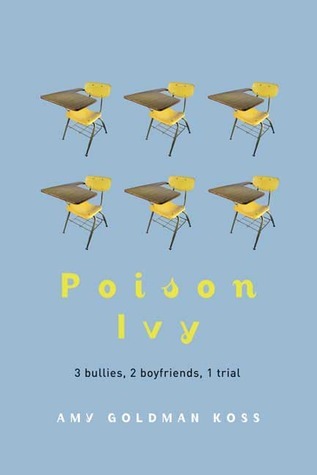 A girl named Ivy goes on trial against her three bullies, Ann, Benita, and Sophia who are known as The Evil Three. This trial is held in class and Ivy’s classmates know everything about it, but still make Ivy suffer for doing nothing. She talks to her teacher about how she is getting bullied and her teacher, Ms. Gold feels the need to have a trial on this. She believes a mock trial is perfect to educate the students about the legal system and solve Ivy’s problem. There are eight first-person narrators showing what they feel about the case during different times. Ivy is the main character and victim who does not want anything to do with the problem but just wanted to share it with her teacher to get it out of her system. Ann is the boss of The Evil Three who starts this mess. Marco is the only student who understands the entire case and is involved throughout. Daria is Ivy’s lawyer who is very shy and surely cannot fight against anyone to have Ivy gain victory. Bryce is the asinine court reporter who knows the truth behind the entire issue but does nothing. Cameron is the bored guy in the back of the room who sleeps through the case, but makes a big difference at the end. Wayne is the “smarty-pants” about law and Faith is the only witness for the prosecution. What does she do or what does she say? Find out…. When starting this book, I understood it was about a school situation and throughout the book, I could relate to events such as getting teamed up on. It was depressing because through each word, I could remember being in the main character’s position and how difficult it was deal with the issue. At one point in the story I asked myself the question: Was it a good thing that Ms. Gold made them have this trial? My answer: It was a great thing that happened so people are aware of what happens at school and how they can deal with it if this ever occurs in the future. I think the book was a bit confusing and had a disappointing ending. The author used great metaphors and similes throughout the book. I felt that it was a different format of writing. Having eight first-person narrators and showing what they felt at each point was nice. I liked how you could see each person and their thoughts being different while being in the same room and knowing the situation. I would recommend this book to kids in middle school. Overall, I would give this book an eight out of ten stars. 1.Who is the main character and what is her nickname? What are her thoughts on that name? 2. Who are The Evil Three and what do they have against Ivy? 3. Why is Bryce’s statement important to judge the people at Ivy’s school? 4. What is Ann doing to Marco and why? 5. Does Marco fall for Ann’s tricks? 6. What is Wayne’s title at school? What is he known for/ to do? 8. What did it say on Jennifer’s MySpace about Daria? 9. What does Ms.Gold make the class do and why? Was it even a good thing to do? What does Ivy feel about it after they start? 10. How does Bryce signal to start the case court? 10a. Bryce is the Court Reporter and is a very asinine boy. He says “Dude! Let the wild rumpus begin!” to start the court case. 11. How could we tell Daria was actually very scared and tensed up before the trial resumed? 12. What is Faith’s reaction when getting the letter to become the new lawyer? 13. Towards the end of the story, what are Marco’s feelings about the case? 14. How do we know Ann is fake, mean, and maybe even be a bully? 15. What is the final decision in the court? 15a. Benita never bullied Ivy meaning that she never tripped, kicked, shot, hit, bit, ot stabbed her. She also never threatened Ivy about anything. Sophie might have said some “not so nice” things, but there is no witness or evidence to say she actually did. Ann actually ended up winning the case even though everyone knew she did bully Ivy.